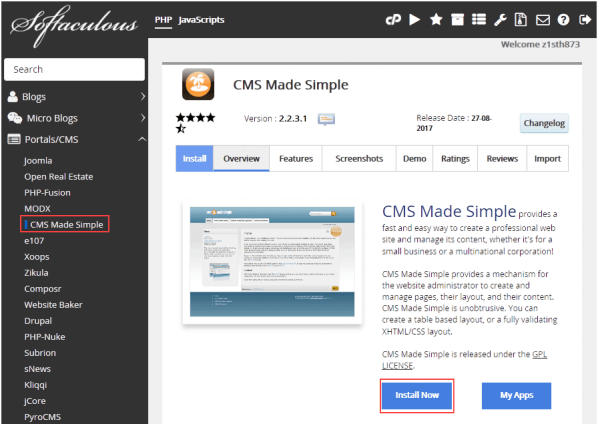 CMS Made Simple (CMSMS) is a free, open source content management system (CMS). It’s a great choice for building and managing small to medium websites with up to about 400 pages. With an easy to use interface and powerful PHP and MySQL back-end, CMSMS is simple enough for anyone to use while also being extensible, fast, and endlessly customizable. 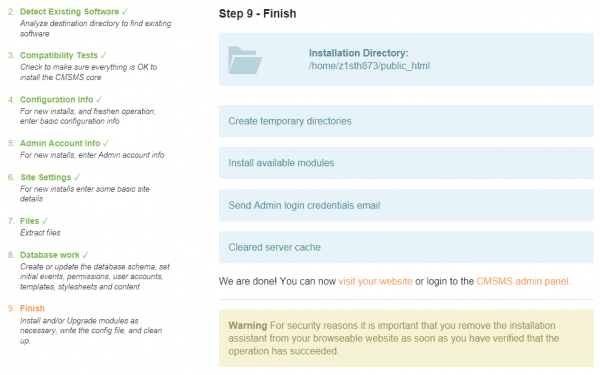 Manual installation via cPanel File Manager. This is the quickest and easiest way to install CMS Made Simple. 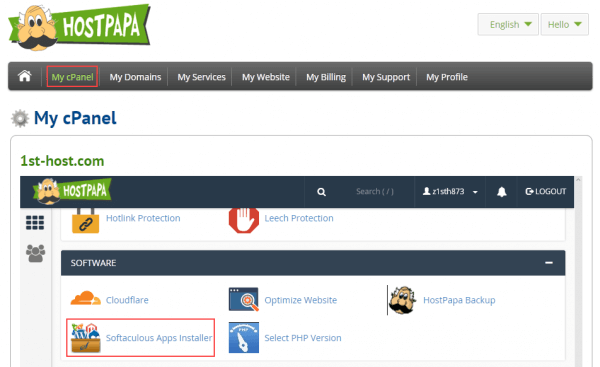 Softaculous is available for all HostPapa shared web hosting accounts and is our recommended method for getting your new CMS Made Simple website up and running quickly. Expand the Portals/CMS menu and click CMS Made Simple. On the Overview tab, click Install Now. Choose Protocol – Select the correct protocol and whether to use ‘www’ before the domain name. If you use an SSL certificate with your site, choose https. Choose Domain – Enter your site’s domain name. In Directory – To install CMSMS at the root of your website, leave this blank. To install in a different directory, enter the name of a directory that doesn’t exist (it will be created during the installation). Site Name – Enter the name that will be displayed on your CMSMS home page. Admin Username – Enter the username you want to use to log in to the admin console. Admin Email – Enter the admin user’s email address. Select Language – Select the site language. Advanced Options – Leave these settings with their default values. If you want the installation details emailed, enter the email address in Email installation details to. Click Install. When done, you’ll see a message letting you know the installation was successful. The message also includes links to your CMSMS site and to the admin console. 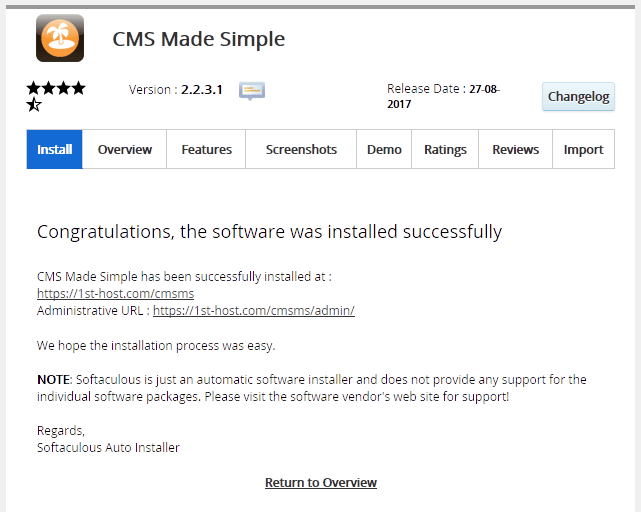 Download the compressed (.zip) installation file for the latest version of CMS Made Simple from the CMS Made Simple downloads page. Remember the name of the file and location where you save it on your computer because you’ll need this information in a later step. 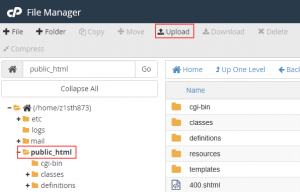 Log in to your HostPapa Dashboard and click My cPanel and then click File Manager. In the File Manager directory tree, select the directory that will be the root directory for your CMSMS site. In most cases this will be public_html, but will be different if you want to install CMSMS in a subdirectory. Click Upload. Locate the compressed installation file on your computer and drop it in your browser, or click Select File and browse to the file. The upload may take a few minutes. When the upload is complete, return to the File Manager. Select the compressed installation file and click Extract. In the Extract dialog box, click Extract File. When the extraction is complete, you should see a file that looks something like cmsms-2.x.x.x-install.php in the directory. The exact name of the file depends on which version of CMSMS you’re installing, but it will be the same as the name of the compressed installation file you downloaded, except it ends in .php instead of .zip. 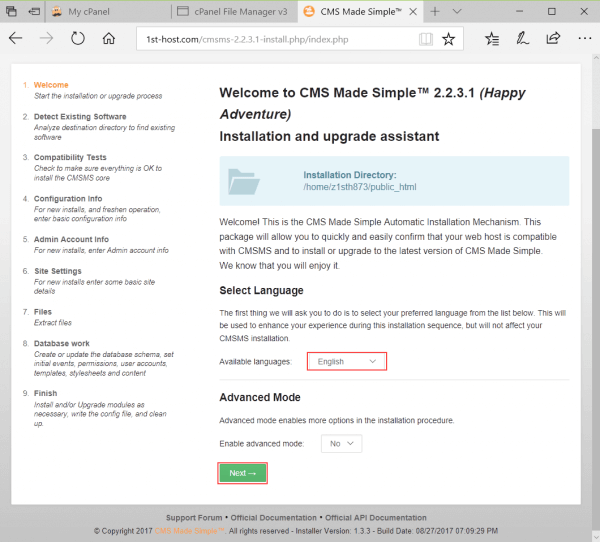 In our example, the file is named cmsms-2.2.3.1-install.php. In your web browser, go to your URL and the name of the extracted installation file (.php). For example, http://www.mywebsite.com/cmsms-2.2.3.1-install.php. If you chose to install in a subdirectory instead of the root directory, the URL will be something like http://www.mywebsite.com/subdirectory/cmsms-2.2.3.1-install.php, where subdirectory is replaced with your real subdirectory name. You should now see the CMSMS installation and upgrade assistant. On the Welcome page, select an Available language. You can enable advanced mode if you choose, but it’s not necessary for most installations. Click Next. The installation assistant checks for an existing installation or other files in the directory. 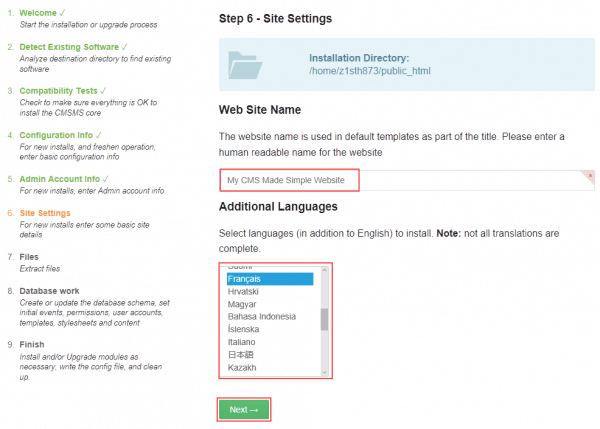 If CMSMS already exists in the directory, you’ll have the option of upgrading the installation. Click Install. 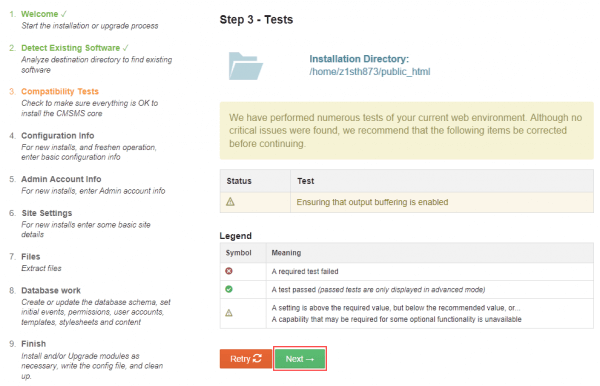 In this step, the installation performs PHP and server tests to make sure the environment is compatible with CMSMS. If there are any failures, installation won’t continue and you should contact HostPapa Support for more information. Click Next. Enter the database information and server time zone. Note that the database user must have all privileges to the database. If you don’t know your database information, see Creating a database in MySQL or contact HostPapa Support for more information. In Server Timezone, select UTC. Click Next. Add your account admin information. The User name is a new admin console user and Email Address is the new user’s email address. The Password is a password for the admin user, not the admin user’s email account. Click Next. Enter the Web Site Name. This is the name that will be displayed on your CMSMS home page. Select any Additional Languages to install. Click Next. The installation assistant now installs the application files. Click Next to continue. 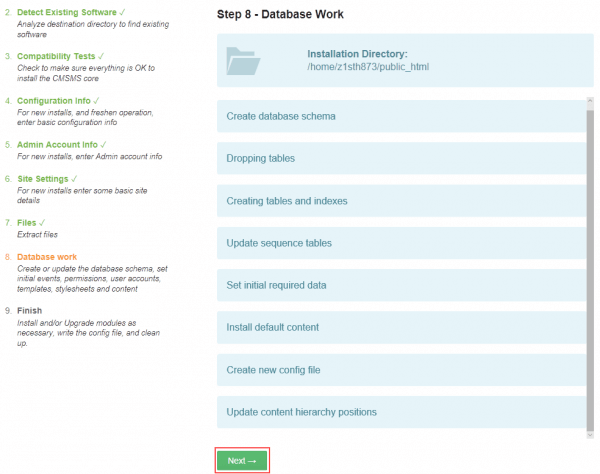 In this step, the installation assistant makes the necessary changes to the MySQL database and adds sample data. Click Next to continue. The installation is now complete. 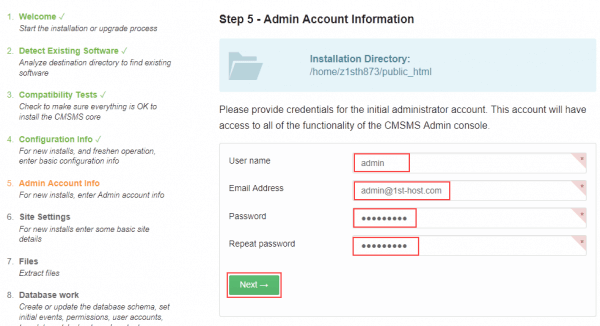 After you confirm that your site is working correctly and you can log in to the admin console, you should delete the installation files (ccmsms-2.x.x.x-install.zip and cmsms-2.x.x.x-install.php) from your home directory. 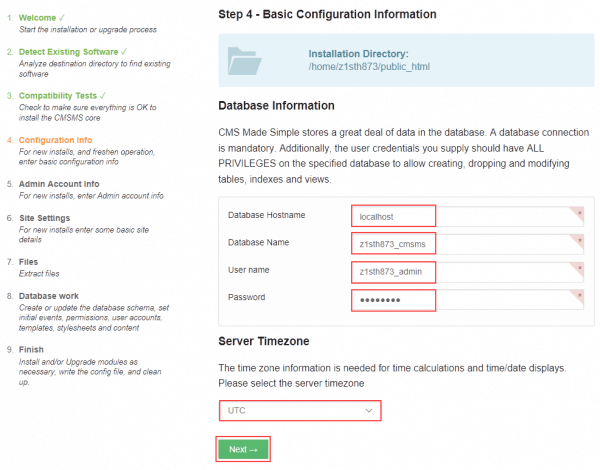 For more information about CMS Made Simple, see What is CMS Made Simple in the HostPapa knowledge base.